Welcome City of Burbank Residents! Eligo Energy IL, LLC ("Eligo"), a leading retail electricity supplier based in Chicago, is proud to have been chosen as the City of Burbank Aggregation Program electric supplier. 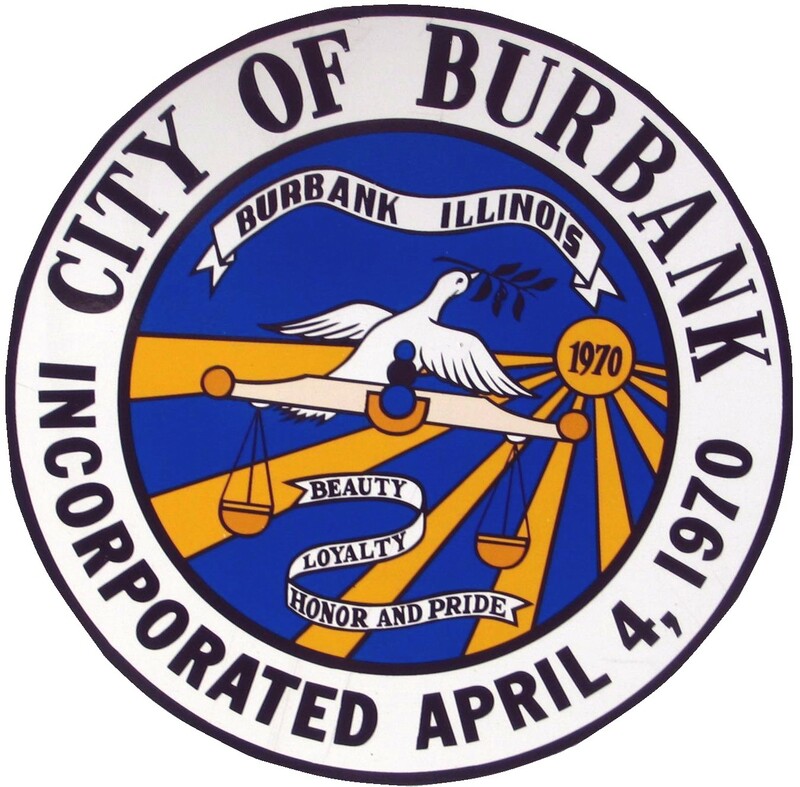 On April 9, 2013, voters in the City of Burbank approved a referendum allowing the community to enter into an electricity purchasing agreement to maximize the electricity supply savings for its residential and small business customers. After an extensive review process, Burbank selected Eligo Energy to supply electricity for the City of Burbank Aggregation Program. PROGRAM DETAILS. The City of Burbank Aggregation Program fixed price is 6.85 cents per kWh and a $5.44 monthly service charge starting from the first meter reading in September of 2017 and continuing for 12 billing cycles thereafter. There is no enrollment, switching or early termination fee. If you decided to participate in the program, you may be able to qualify for a high energy efficiency savings program , with an instant rebate on the monthly fee portion of the program and a special rate of $0.0685 per kWh (no monthly fee). Please note that each customer's opt-out letter will indicate whether or not that customer qualifies for the instant monthly fee rebate. If you did not qualify for the instant rebate at the beginning of the program, you may inquire with Eligo again after January of 2018 (after release of pertinent ComEd data). If you have questions about the high efficiency program, please see Frequently Asked Questions and Terms and Conditions sections. You can also call us at 312-260-0885. To increase your energy efficiency, amongst other steps, you will need to reduce your energy usage during peak usage times (e.g., Summer afternoons). For more information on how to qualify for the high efficiency savings program, please visit our efficiency guide. Customers may also purchase their electricity supply from other Retail Electric Suppliers or ComEd. For more information, visit www.pluginillinois.org. Customers may request from the Illinois Power Agency, without charge, a list of all supply options available to them in a format that allows comparison of prices and products. Net metering customers may forfeit credits for electric supply service and delivery service, or both, if they switch to an Aggregation supplier. In addition, municipal aggregation members are entitled to savings on ComEd’s new “Renewable Energy Adjustment” fee. Beginning with the June 2017 billing period, there will be a new charge in the “Taxes & Fees” section of your ComEd bill. This charge will be called the “Renewable Energy Adjustment” and the amount of the Renewable Energy Adjustment will be different depending on your electric supply option. If you are receiving fixed-price supply service from ComEd, the Renewable Energy Adjustment will be a charge of 0.189 cents/kWh. If you are receiving supply service from as part of the City of Burbank municipal aggregation, the Renewable Energy Adjustment will be a charge of 0.094 cents/kWh. Starting with the June 2018 billing period, the charges of the Renewable Energy Adjustment will be as follows: 0.189 cents/kWh for ComEd’s fixed-price supply service customers and 0.142 cents/kWh for municipal aggregation customers. NO CHANGES IN YOUR BILLING OR SERVICE. ComEd will continue sending monthly bills, responding to outages, and delivering electricity. You will still be eligible for the same programs you are eligible for now through the utility, such as Budget Billing, payment agreements and energy efficiency programs. The only change will be in the Electric Supply price on your ComEd bill – www.comed.com/MyAccount/MyBillUsage/Pages/UnderstandingMyBill.aspx. NO DOOR-TO-DOOR / TELEPHONE SOLICITATIONS. No one from the Aggregation Program will ever come to your door to ask you to switch to a new supplier. Anyone who does come to your door is NOT with the City of Burbank Aggregation Program. Likewise, unless requested to do so, Eligo will not call you to offer you different services. Any door-to-door or telephone solicitations are from supplier other than Eligo Energy. ENROLLMENT PROCESS. Once your account is enrolled, you will receive a confirmation letter from ComEd confirming your "switch" to Eligo. To remain in the electric aggregation program, please disregard this letter when it arrives. Approximately 30 to 45 days after enrollment, you will receive your first bill with your new Eligo price. Please review the enclosed Terms and Conditions for additional information. OPT-OUT INSTRUCTIONS. If you choose not to participate, you can elect to be removed from the Program by completing and returning the Opt-Out form enclosed with your Opt-Out letter, calling Eligo at 312-260-0885, or emailing BurbankOptOut@eligoenergy.com by 21 days from postmark date. You may be asked for a unique identifier number found on your Opt-Out letter or your ComEd account number in order to process your opt-out request. If you have questions or need additional information about Municipal Aggregation or Eligo, please contact Eligo at 312-260-0885 or review the FAQs. Eligo Customer Care is available 8:00 AM to 5:00 PM Monday through Friday at 312-260-0885. ADDITIONAL INFORMATION. Qualifying Burbank residents who previously opted-out of the program, recently moved to the Burbank community, or are receiving service from another supplier may still enroll in the program. Call Eligo at 312-260-0885 or click the Enroll button below to enroll today through our quick, easy enrollment process. Please check with Eligo customer service to find out if you qualify for the energy efficiency monthly fee instant rebate. Eligo may send opt-out letters several times throughout the term of the program to eligible Burbank customers who have recently opened accounts with ComEd, ensuring that every customer has an opportunity to opt-out before being enrolled. If you have questions about the Burbank Aggregation Program, please see Frequently Asked Questions and Terms and Conditions sections. You can also call us at 312-260-0885. What is a municipal aggregation? Municipal aggregations are groups of customers or entire communities that unite to pool, or aggregate, their energy buying power. By pooling their buying power and negotiating the price of power from a supplier other than the traditional utility, municipal aggregations can often save participants money on their electricity bills. ComEd would still be responsible for delivering that power to your home, responding to outages, and billing you for it. How will the City of Burbank Aggregation Program impact my current situation and electricity bill? Your municipal aggregation rate will appear on your ComEd bill. You will continue to receive a single bill directly from ComEd, make one payment to ComEd, and continue to receive all other services through ComEd. Beginning with the June 2017 billing period, there will be a new charge in the "Taxes & Fees" section of your ComEd bill. This charge will be called the " Renewable Energy Adjustment" and the amount of the Renewable Energy Adjustment will be different depending on your electric supply option. If you are receiving fixed-price supply service from ComEd, the Renewable Energy Adjustment will be a charge of 0.189 cents/kWh. If you are receiving supply service as part of Burbank's municipal aggregation program, the Renewable Energy Adjustment will be a charge of 0.094 cents/kWh. Starting with the June 2018 billing period, the charges of the Renewable Energy Adjustment will be as follows: 0.189 cents/kWh for ComEd's fixed-price supply service customers and 0.142 cents/kWh for aggregation customers. What is my rate under the City of Burbank Aggregation Program? As an eligible member of this program, you will automatically receive a price of 6.85 cents per kilowatt-hour (kWh) as well as a $5.44 monthly service charge starting from the first meter reading in September of 2017 and continuing for 12 months thereafter. Qualifying energy efficient customers will receive an instant rebate on the monthly fee portion of the rate and will pay 6.85 cents per kWh. Your opt-out letter will inform you if you qualified for the energy efficiency instant rebate. For more information on how to qualify for the energy efficiency program, please visit our efficiency guide. Your electricity bill generally has several cost components – distribution and supply. The aggregation program changes only the supply component of your bill. All other components of the bill will not be affected. However, as an aggregation customer, you will receive a discount on ComEd's new Renewable Energy Adjustment fee, which is found in the "Taxes & Fees" section of your ComEd bill. Are there additional fees for participating in aggregation program? If you are a ComEd customer, generally, ComEd will not impose any switching fee for participating in Aggregation Program. Moreover, as an aggregation customer, you will receive a discount on ComEd's new Renewable Energy Adjustment fee, which is found in the "Taxes & Fees" section of your ComEd bill. Residential or small commercial customers located in the City of Burbank may participate. A "Small Commercial Customer" is a retail customer with an annual electricity consumption of less than 15,000 kilowatt-hours. Customers enrolled in real time pricing, Power Smart Pricing, electric space heat rate, or served by an alternative retail electric supplier are eligible under the law, but are not necessarily automatically enrolled. If you are in one of these programs or with a different supplier, you will need to review your pricing and contractual obligations in order to determine which options are available to you at this time. You may always call us with any eligibility questions at 312-260-0885. What is the energy efficiency / demand response rebate program? City of Burbank municipal aggregation customers that do not put a strain on the electrical system during peak usage times and exhibit patterns of off peak electricity usage may qualify for an instant rebate on the monthly fee portion of the electricity rate. Eligo will make the program available to qualifying customers at the beginning of the program and will reevaluate qualifications once again with the release of ComEd data in January of 2018. You may always call us with any eligibility questions at 312-260-0885. How do I enroll in the City of Burbank Aggregation Program? The City of Burbank Aggregation Program is an opt-out program. That means that there is nothing you need to do to enroll. You will automatically be included in the aggregation program unless you choose not to participate and opt-out. Qualifying City of Burbank residents who previously opted-out of the program, recently moved to the City of Burbank community, or are receiving service from another supplier may still enroll in the program. Click the Enroll button to enroll today through our quick, easy enrollment process or call us at 312-260-0885. Please have your utility account number for enrollments. Is there a Green Energy option under the City of Burbank Aggregation Program? For eligible customers interested in 100% renewable energy, Eligo is proud to provide a clean energy sources option. Call Eligo at 312-260-0885 in order to inquire into a 100% renewable energy option. Do I have to participate in the City of Burbank Aggregation Program if I do not want to? No. Residents and small businesses that do not want to participate can opt-out without penalty. To opt-out, return the opt-out form attached to the opt-out letter you received, email BurbankOptOut@eligoenergy.com or call Eligo at 312-260-0885. You may need to provide your unique identifier number printed on your opt-out letter or your ComEd account number when opting out. If I am automatically enrolled in the program now, can I leave the program at any time? If you do not wish to participate in the electricity supply savings, return your opt-out card. After the opt-out period, you may rescind your agreement without penalty up to 10 calendar days after ComEd processes the enrollment request. After the 10-day rescission period, you may cancel your service with Eligo at any time without any Early Termination Fees. Can I enroll later if I opt-out now? You may request to join the program online at http://www.eligoenergy.com/cities/il/burbank or by calling Eligo at 312-260-0885. You may also visit www.eligoenergy.com for other rate plan options. Program terms and conditions may differ from the aggregation program. I already have electric service with this supplier at a different rate. How can I join the Aggregation Program to get this new, lower rate? Enroll online at http://www.eligoenergy.com/cities/il/burbank or call 312-260-0885 for information about how to switch to the City of Burbank aggregation. Who shall I call if there is an outage or issues with my electricity bill? ComEd will remain responsible for the delivery of the electricity. 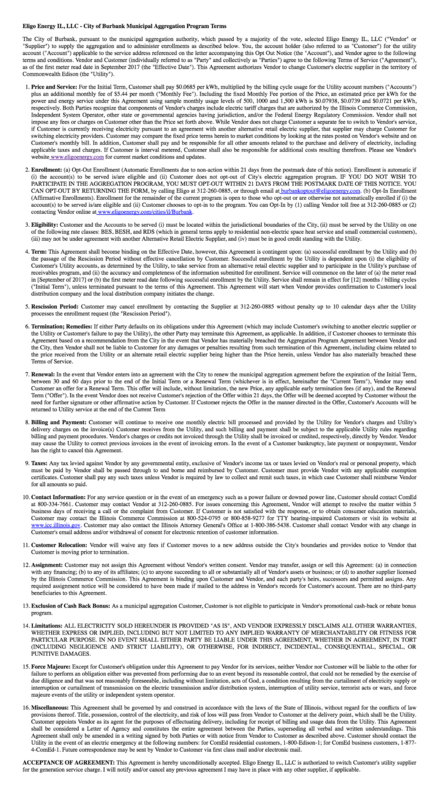 All service and billing questions will continue to be directed to ComEd. To reach ComEd, please call (800) 334-7661. Will ComEd continue to service my account? Yes, nothing will change in terms of receiving your electricity or any customer service. ComEd will continue to read your meter, service your account and send you one bill each month. You will continue to contact ComEd for any billing or service questions or if your power ever goes out. I'm on ComEd's budget billing plan. Will that change? No, you can stay on the budget billing plan. Can I still have my payment automatically deducted from my checking account as I do now? Can I enroll if I am on ComEd's Hourly Program? Before enrolling in the aggregation, you should evaluate how the aggregation compares to your existing ComEd hourly service. Potential savings from the aggregation depend on your actual hourly use patterns. Accordingly, any potential savings from the aggregation compared to your current utility hourly service may vary from customer to customer. You should also review the terms and conditions applicable to your ComEd hourly service. The terms and conditions of ComEd hourly service may prevent you from joining the Program at this time. Additional information to help you evaluate your supply options can be found on the Illinois Commerce Commission's website: www.pluginillinois.org. Can I enroll if I am on ComEd's Net Metering Program? Before enrolling in the aggregation, you should compare the Village of Niles aggregation rate to the rate you are currently paying for electric supply to determine if you would benefit from participation in the aggregation. You should review the terms and conditions associated with your current electric supply, or check directly with your current electric supplier, to determine if there are any penalties or fees associated with an early termination of your current electric supply agreement. Net Metering customers may forfeit credits for electric supply service and delivery service, or both, if they switch to the Aggregation Supplier. Additional information to help you evaluate your supply options can be found on the Illinois Commerce Commission's website: www.pluginillinois.org. Will someone come to my home or call to sign me up? No one from Eligo Energy or the City of Burbank will ever visit your home to sign you up or call you to enroll. If someone calls or visits your home, that person is not from the Government Aggregation program. What is the downside of the program? Residents of municipalities that enrolled in aggregation programs in the State of Illinois are reporting no negative issues and are generally pleased with the rates on their electric bills and rate stability. Deregulation of energy in Illinois has resulted in downward pressure on prices across the State.